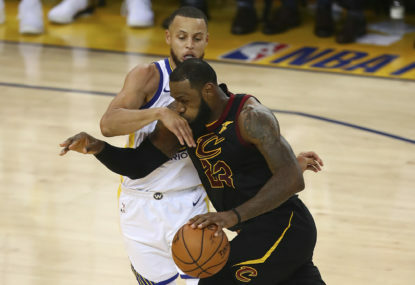 Facing a demoralizing sweep, LeBron James and the Cleveland Cavaliers will look to stay alive in Game 4 of the NBA Finals against the now seemingly untouchable Golden State Warriors. Join The Roar for live scores and coverage from 11am (AEST). Following another brutal loss in Game 3, LeBron and his fellow teammates must capitalize at home and take advantage of the small mistakes. Even with the greatest shooter of all time, Stephen Curry, playing extremely out of character – the Cavs just could not stop Kevin Durant or execute offensively down the stretch. Game 3 saw Rodney Hood step up, knocking down seven shots in 11 attempts. Kevin Love also played a nice game offensively, but was completely exploited by Kevin Durant on defence when he was switched on. If Cleveland wants to find themselves in the win column in front of their home fans at Quicken Loans Arena, they are going to need to be perfect and support LeBron in every way. Durant, who scored 43 points on 15 of 23 shooting, was blazing by the end of the contest. Curry and Klay Thompson combined for a measly 21 points, yet Golden State still notched the 110-102 victory. Tristan Thompson and JR Smith have proved to be just about useless offensively. Jordan Clarkson has likely seen himself out of the rotation as well. However, and I have said this since before Game 1 (which should have been the Cavs’) – I think LeBron is just too good to be swept in any scenario. Thanks to home court advantage, another inhuman performance from LBJ and a bit more support from guys like Kyle Korver and Love, I think the Cavs avoid the embarrassing sweep. Though Curry will bounce back in Game 4, LeBron is LeBron. Be sure to join The Roar for live coverage of Game 3 from 11am (AEST) and join in the discussion with me.